A long time ago, Beaver Falls was a buzzing industrial hub. Now many of the remnants of that time period remain standing frozen in time. The jewel of this small city is Geneva College, a small Presbyterian Liberal Arts College that seems like it has a perfect little campus. Many other areas of the city appear to be frozen in time. Some small industry remains, but the bulk of it has not been reclaimed yet. 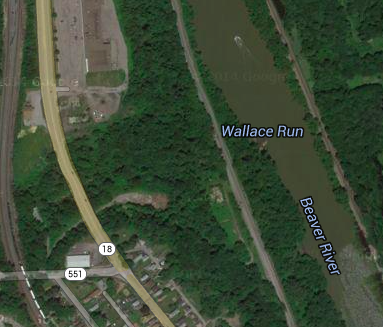 Pollution still hampers the town as well, with drillers upstream dumping toxic chemicals into the Beaver River. 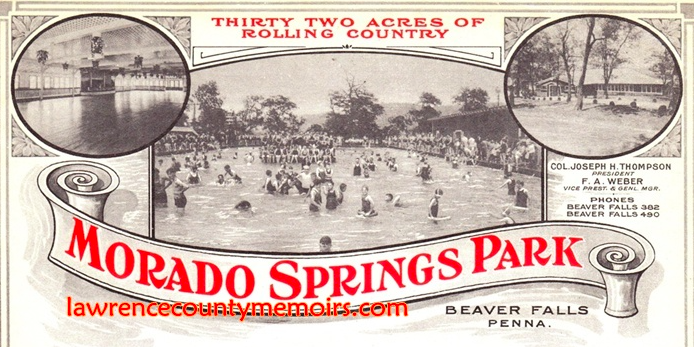 With Beaver Falls being the smoky and gritty city that it was, Morado Park offered a place for the townspeople to getaway to a quiet place. The park was opened in 1891 by the Beaver County Traction company. It was primarily a picnic ground that is said to have had a carousel and lots of groves. It is also said to have a swimming area in the Beaver River, which I cannot imagine the pollution that these people were taking in as they swam. As was the case with most of these turn of the century amusement parks, one of the primary attractions was a dance hall that was the site for nightlife during that time period. It seems as if the dance hall stayed open after the park closed and was turned into a skating rink. It is not standing anymore though. The park closed in 1937, surprisingly longer than most of these old trolley parks. Everything I am finding shows that the only ride this park had was a carousel. The make is unknown and it is also unknown if the park had other rides. It would not be a surprise to me if the park had more rides than that, because the legendary Harry Traver came around and his Traver Engineering Company was founded in 1919 and located just down the street. I would imagine that Traver would find it convenient to have a nearby show park for his creations. The closest confirmed park to Traver Manufacturing was Cascade Park in New Castle, which once boasted a Tumblebug and a Circle Swing ride. No Circle Swing Rides remain, and only two Tumblebugs remain, one at Conneaut Lake Park and the other at Kennywood Park. It would not surprise me if one of these Traver contraptions was built at Morado. Here is a view looking towards the park. I am not sure where the boundary was, but this was either in the park, or looking towards the park. I am not sure if the park extended this far, but this sad little shopping center that seems to be completely vacant, sits on this spot. As I said, Beaver Falls feels like it is frozen in time. Seeing these old theater signs with "Thank You" messages is always really depressing. Anyways...You would have no clue that an amusement park was once located around this spot. Our destination for Valentine's Day Weekend was the Hotel Conneaut for their Valentine's Day Dinner and lodging. Valentine's Day doubles as our anniversary as a couple. Six years together and we will be getting married in July! The staff was accommodating for our overnight stay. This 122 year old Hotel has quite a bit of charm. If you are expecting a five star resort, this is not the place, but if you love history and beautiful views, you will love this place. You can see more photos on our Interesting Pennsylvania page. The carousel and Blue Streak station. The Devil's Den dark ride, the only remaining gravity fed Pretzel Dark Ride. The NAD train on the Blue Streak. The majestic front of an NAD train. The Turtle, one of only two remaining Traver Tumblebugs in operation. This is what a drop with ridiculous airtime looks like! Now over to the parking lot side of the park. Here you can see the Chance Toboggan. This is going to get moved at some point in the future. In the mean time it is sitting and waiting to be moved. I would love to see this get used in the park again, or any park again, for it is one of only three that remain. It would be cool to see this go out onto the carnival circuit again. The Blue Streak is threatened right now. I hope it remains for generations to come. Everything at this point looks like the park will be opening again in May. Turn around! The turnaround was originally designed by Vettel to be only roughly six feet from the ground. It was redesigned at one point by John Allen of PTC to be raised after the turnaround was found to be too intense for the average rider. This is a white knuckled thrill machine. I challenge you to ride in the backseat the next time you go to the park. And off we go again! The park is set to open on May 22nd, according to the park's brand new website. This weekend we went up to the Erie region for a relaxing Valentine's Day weekend. Our first stop was the Tom Ridge Environmental Center at Presque Isle State Park and Waldameer. What do the foxes at the Tom Ridge Environmental Center say? "Check out the view!" Whoa! Ravine Flyer II is always stunning to look at. The way they fit this twisted masterpiece through the valley of this ravine is nothing short of amazing. It was a really snowy day. The snow was picking up as we took these shots. I can't wait to ride this airtime filled giant again come spring time. You can't beat the succession of sharp curves, giant drops, and assortment of wicked airtime. Here is the powerful turnaround. The blue that you can see through the supports is the bridge that goes over the Peninsula Drive four lane highway. You can't beat the view from the top of this 115 foot drop, looking over Lake Erie and the peninsula of Presque Isle State Park. The Ferris Wheel greets us on National Ferris Wheel day, a day of rest for all Pennsylvania Ferris Wheels. The turnaround as seen from the bird observation area at the Tom Ridge Environmental Center. Now we take a look at the construction for the 2015 waterpark expansion and new entry gate. This area will look completely different come opening time. A large portion of the parking lot is now going to house a wave pool and new entrance gate. In coming years there will be a bunch of new waterslides added as well. The new building will house changing facilities and food concession. The fence on the edge is the new park boundary. The new entrance will be off to the right of where this photo was taken from. There will still be parking in the area beyond the fence. In between the top of the green slide and the pavilions, you can see where the new entry way will be. It is currently under construction under covers to protect it from the elements. Here you can see the new changing facilities and food stand. Here is the wave pool under construction. Blizzard conditions on a Saturday did not stop the workers from plugging away. The wave pool is being built with two tiers and a peninsula to boost capacity on more busy days, and to have the ability to close one side and lower costs on slower days. The wave pool is an exact copy of a wave pool at Holiday World. Look for new waterslides around this wave pool in coming years. Our next stop will be a journey through Presque Isle State Park here on our other page, and then we will head down to Conneaut Lake Park to spend the evening in the Hotel Conneaut and get some views of the park after this blizzard. One more view of Ravine Flyer! I had the chance to check out the new double decker carousel at the Century 3 Mall in West Mifflin, PA. This carousel is operated by a vendor that has a contract with the mall. The operator told me that it was moved from another mall in California and that it was built by Chance. It is a gorgeous machine that has helped to breathe life into this transforming mall. I have gone to the mall several times since it was installed over the summer, and there have always been some riders. Next door to the carousel is Bradley's Books, where you can find several amusement park related books, including our friend Dave Hahner's recent book on Kennywood, and our book on Pennsylvania Amusement Parks. It is an honor to be on the same bookshelf with Dave Hahner, one of the most knowledgeable people out there when it comes to amusement parks. Venturing further through the mall property, you see many vacant storefronts, including several anchor department stores. At one point this mall was home to 200 businesses, and it was the largest in America. It was built upon the slag pile left over from local steel production. It was a huge undertaking to make this land stable enough for a mall. A perfect storm in the nationwide decline of malls, and the economic plight of the region and the Rust Belt as a whole, has caused this mall to struggle. New ownership has come in that is looking to expand the entertainment offerings of the mall, including this carousel and a high tech movie theater. Hopefully the plans come to fruition to not only revive the mall, but to also provide employment to people in the region. Lots of empty directional arrows for former department store anchors. Sears closed just this past December, just in time for Christmas. How kind of them! For those of you carousel lovers out there, be sure to visit this mall. I recently came across this Postcard from the old Paxtang Park in Harrisburg, PA.
Once upon a time in Harrisburg there was an amusement park. Paxtang Park was built in 1893 as a trolley park to boost weekend ridership, in what is a familiar development for the older Pennsylvania amusement parks. It boasted two different coasters, one of which was built by Miller and Baker, that boasted of crossing Spring Creek four different times. This postcard makes the park seem like it was a pretty tranquil place. Several causes are cited for the loss of the park. The first of which was that the park was dropped from ownership by the trolley line in 1923. A private individual was able to take control of the park, but it then closed in 1929. Up until this point, this once rural spot was becoming a suburb with housing surrounding the park. Between the growing suburb around the park, the start of the Great Depression, and competition from Hersheypark, this park closed. Our friend Harry Michelson found these newspaper clippings that tell the story of Paxtang from transfer to private ownership to closure. "On August 8, 1922, the owners of the land (the Rutherford's) agreed to transfer control of the land to an amusement company out of Newark, NJ. There wasn't a lease to sign in this case - the Rutherford's simply gave their power of attorney on the land to Kerstetter, essentially." "This is the announcement that the East Harrisburg Street Electric Railway Company was leasing Paxtang Park to convert into an amusement park from July 20th, 1893"
"Officially, the Steelton Bank & Trust Company closed the property on April 21, 1930. 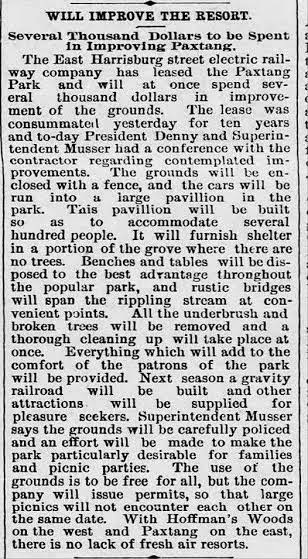 One reason it lost to Hershey was also due to size - the more popular picnics outgrew Paxtang Park's capabilities - which Hershey was able to do. Another reason was the Park's decline in popularity due to it's struggles opening for the new season; in the last few years of operating, the park didn't officially open until late June of each season." Thanks to Harry for some great additional insights into the park to help put together the whole puzzle of this lost park.